If you aren't already familiar, terrain is a garden center / cafe by URBN INC (Anthropologie & BHLDN). It is "inspired by the idea of merging house and garden to create an experience for the senses" (urbn.com). Being there you feel as though you've just stepped into a photo set for Anthro. It's purely magical. I was introduced to them through one of my dearest friends, Kristen Hudson Nichols about three years back. We went for lunch in their cafe (delicious!) and then I was promptly inclined to spend my entire paycheck on the various plants and planters and lotions and books and stationary and... well you get the idea. If you are ever in the Glen Mills, PA area, I highly, highly reccomend stopping in. 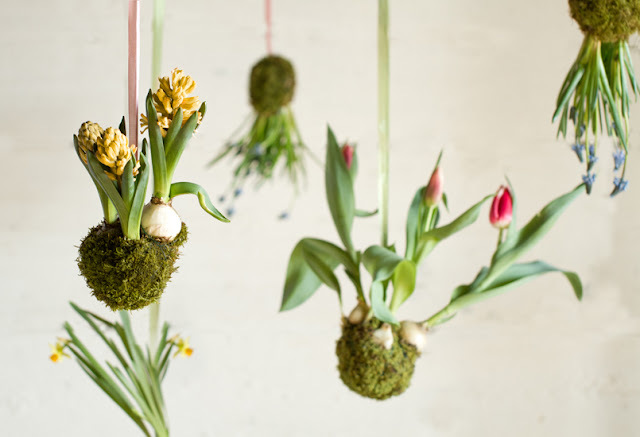 To the point, today on terrain's blog I came across this oh so cool tutorial for Spring String Gardens. I am going to try creating these and hanging them at the sunny window in my dressing room. The tutorial sounds simple enough, but I'm sure I'll make a mess! I will report back with how well it goes. Have any of you ever tried something like this?